Alexandria, VA (July 11) Feminists for Life of America debuts a new online resource for women today. 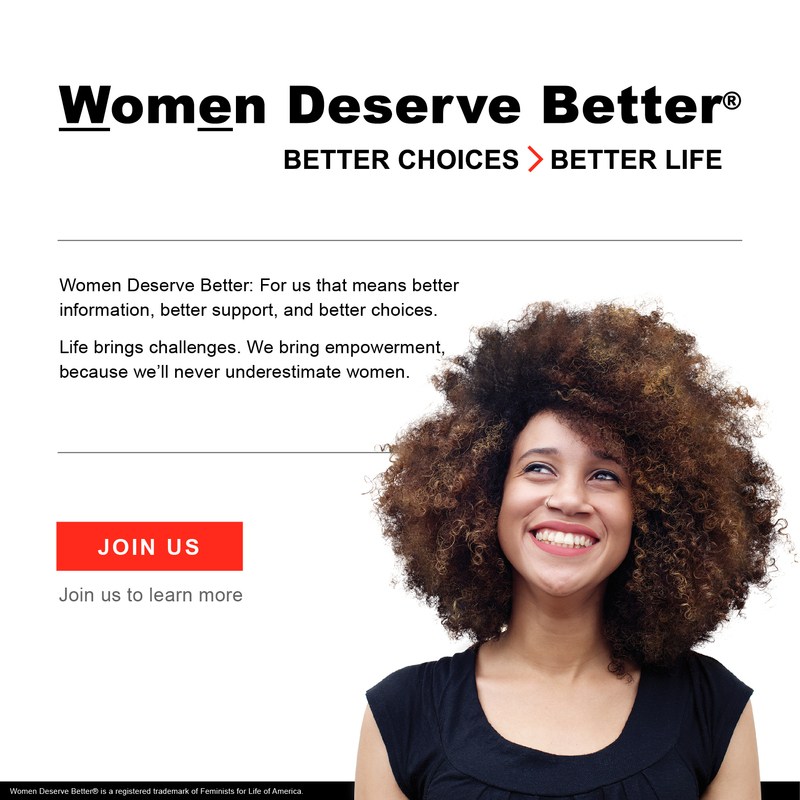 WomenDeserveBetter.com aims to support women by providing education, resources, and inspiration in the areas that statistically relate to the feminization of poverty. Organized into four sections — Live, Work, Learn, and Love — the site provides resources for student mothers and working parents as well as birthmothers and parents of special needs children. Feminists for Life aims to do this in a way that no other organization is doing — by delivering this information in FFL’s unique, pro-life feminist voice. • 59% are already mothers (including those who had children in high school and during college). “The Guttmacher Institute’s research confirms that abortion is a reflection that we have not met the needs of women. In a time of great division, there is much work to be done that all feminists and pro-lifers can agree upon,” Foster explains. • Empower those women most at risk of abortion by offering the tools to build a sustainable and meaningful life for themselves and for their families. • Educate through valuable and practical information delivered in a clear and easy to understand manner. • Inspire readers with what is possible and remind every woman to never underestimate herself. Established in 1972, Feminists for Life of America is a nonsectarian, nonpartisan, grassroots organization that seeks real solutions to the challenges women face. FFL’s efforts are shaped by the core feminist values of justice, nondiscrimination, and nonviolence. Feminists for Life of America continues the tradition of early American feminists such as Susan B. Anthony, who opposed abortion. • led the effort to develop on-campus resources and support for underserved pregnant and parenting students and is an outspoken opponent of pregnancy discrimination. • successfully advocated benefits for poor and pregnant women through the State Child Health Insurance Program. • worked in coalition with other women’s organizations to defeat the mandatory “family cap” and other punitive child exclusion provisions in welfare reform. • helped to prevent poverty and coerced abortions due to threats to withhold child support through passage of the Enhanced Child Support Act. We encourage you to join WDB’s e-list for the latest news and updates.